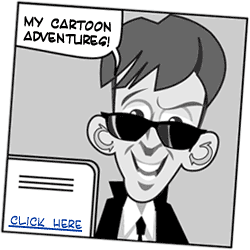 The Adventures of Mister E.
Number-crunching is the favorite pastime of Mister E. His favorite type of numbers? Primes! (these are numbers that can only be divided by 1 and themselves). This year, 2013, scientists have found the biggest prime number yet, with an astonishing 17.425.170 digits! To put this search for the biggest prime in perspective, the previous biggest prime was found in 2008. It had "only" 12.978.189 digits.